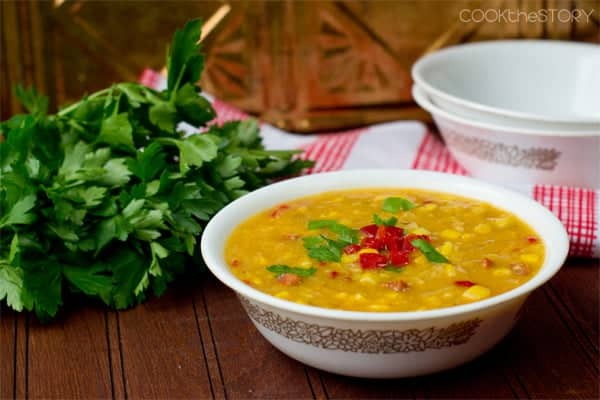 This Spanish Corn Chowder recipe is ready in under 15 minutes. It has sweet corn, chorizo, roasted red peppers and parsley for some fresh flavor. If you’ve ever traveled in Atlantic Canada, you’re probably not surprised that the word chowder originated there, since chowder is a staple on virtually every menu. One of my most vivid early restaurant memories is of eating lobster chowder with my mom in Nova Scotia, at a little restaurant across the street from the motor inn where my family and my brother’s baseball team and all of their families were staying for a baseball tournament. The soup was rich and thick and had more lumps of lobster than of potato. We went back to that restaurant three times during our short stay. And we ate nothing but chowder. Oh how I love chowder! Later on in my Soup in 15 series I’ll be bringing you a Manhattan and a New England Clam Chowder (ready in under 15 minutes, of course!). But since it’s August (i.e. not a month with ‘r’ in it and thus not a month that is traditionally famous for clam-eating2) I decided to go with a corn chowder. But this isn’t just any corn chowder. 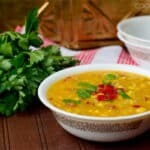 This is a Spanish Corn Chowder. 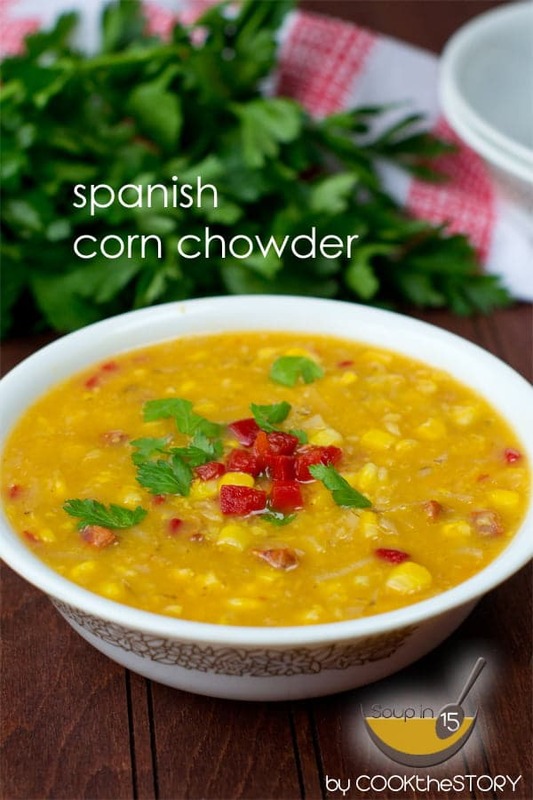 This quick Spanish Corn Chowder has corn (of course! ), Spanish chorizo, smoked paprika, roasted peppers (I’ve used diced pimentos because they’re already chopped up) and parsley. It’s light and bright but also thick and rich and comforting. The Souper Tip for this soup, the thing that makes it so delicious so quickly, is to use a grated potato as the thickener. Most chowders have chunks of potato in them. But those chunks wouldn’t cook in under 15 minutes. Therefore, to make this soup, I use grated potato. 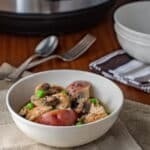 The shreds go into a pot of bubbling broth where they simmer, soften and begin to disintegrate leaving behind that hearty thick flavor and texture of cooked potato. To see all my Souper Tips, the techniques and ingredients that get the Soup in 15s delicious so quickly, click here. And click here for all of the Soup in 15 recipes, coming to you once a week for a year. 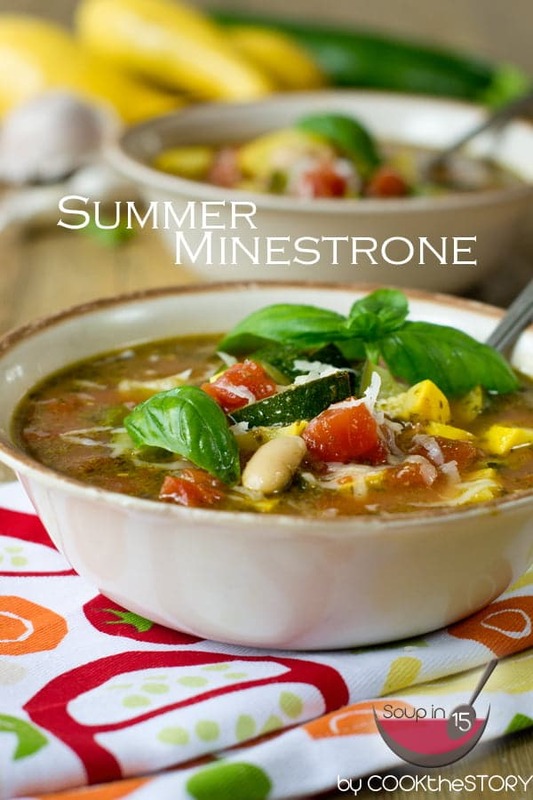 Oh, and if you’re looking for another quick soup recipe with corn, be sure to also check out my summer minestrone soup recipe. And now, here’s my Spanish Corn Chowder recipe. See you in 15! 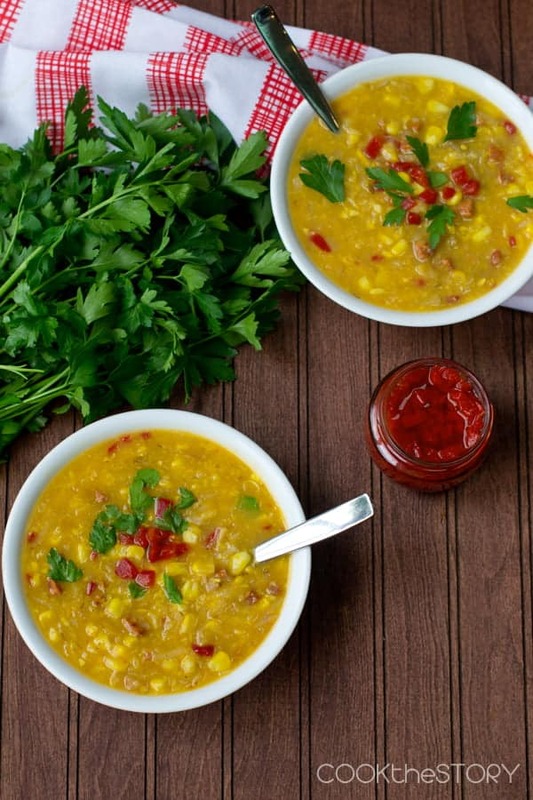 This Spanish Corn Chowder recipe is ready in under 15 minutes. It has sweet corn, chorizo, roasted red peppers and parsley for some fresh flavor. To make the soup as quick as possible, first read through the recipe. As you read, gather up all the tools, pots, bowls and ingredients that you'll need. Then start cooking. 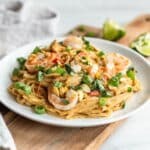 Note: If you know that your stove is not very powerful, you may want to start heating the broth in the microwave while you read through the recipe and gather your ingredients and tools. Yield 8 cups. Put a large pot or Dutch oven over high heat. Pour in the chicken broth and cover it. Grate the potato (peel and all). Put the corn in a microwave-safe bowl. Put it in the microwave on full power until defrosted and warmed, 2-3 minutes. When the broth comes to a boil, add the potato. Stir. Re-cover the pot. When it reaches a boil again, reduce heat to a moderate simmer. Cover. Finely chop the chorizo. Add to pot. Stir. Cover. Scoop out 1 cup of the broth and put it in a blender with 2 cups of the defrosted corn, the salt and the paprika. Puree. Pour it into the soup pot along with the rest of the corn and the diced pimentos with their juice. Continue to cook the soup covered at a moderate simmer until the potato shreds are cooked through. While it finishes cooking, chop the parsley. Serve the soup garnished with the parsley. 1The info about the etymology of chowder comes from Wikipedia and What’s Cooking America. 2The info about clams and months that do not contain the letter ‘r’ is from The New York Times. Note that while it is not safe to harvest your own shellfish during these months, it seems that it is safe to eat commercial shellfish. This is so awesome on a cold day! Love to dip some crackers in it, even fresh whole wheat bread is amazing in it. 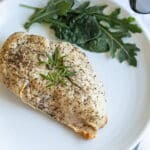 Great easy recipe. I love smoked Spanish paprika and this easy soup recipe sounds so good! Pinned!